This post is dedicated to usage of one of the most important technologies in ETL space – SQL Server Integration Services and its integration with the Columnstore Indexes. 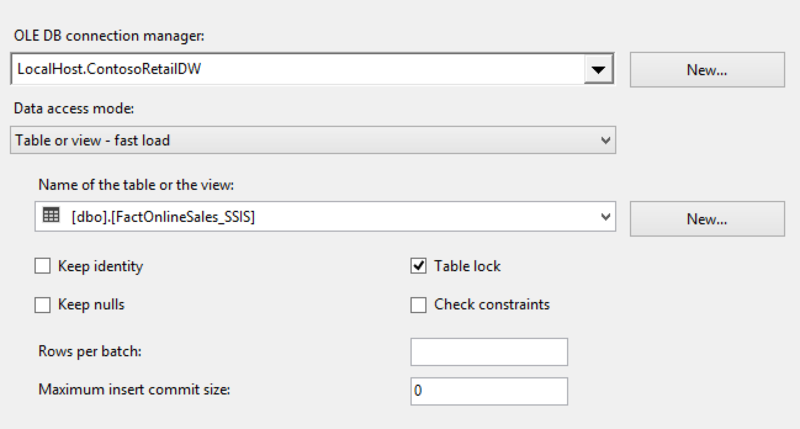 I have found that some of the aspects of Columnstore Indexes options in SSIS not very clear and thought that a detailed post on this topic might help those who are working with this technology mix. On the right side you can see how exactly my OLEDB Source properties look like. I decided not to use any advanced options, since I just wanted to see how SSIS reacts on the data transfer and if it truly works with BULK Load into Clustered Columnstore Index. For the OLEDB Destination properties I decided to leave them at the Defaults, since I am reading over 102.400 rows and OLEDB Destination should take care of the inserting data through BULK API, creating 1 compressed Row Group. Notice that I have not changed any property of the Data Flow as well, leaving all properties at the default. Surprise! We have got 1 open Delta-Store like if we would not have used Bulk Load API at all. 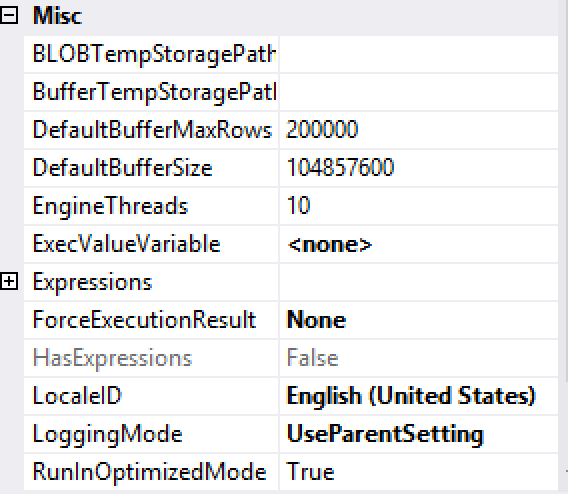 Sure thing that I have not set the value for the “Rows Per Batch” property at the OLEDB Destination, nor have I changed the default value for the “Maximum Insert Commit Size” property, but I would expect the default values to work correctly for the Bulk Load for the Columnstore Index, because honestly most people using Clustered Columnstore Indexes most probably are not using the trickle inserts. At this point I have simply started to believe that there was something wrong with OLEDB Destination. There were still a couple of properties left, and so I configured Data Flow “Default Buffer Max Rows” property, changing it from the default value of 10.000 rows to 150.000 rows. The final result has not changed a bit, still delivering one single uncompressed Delta Store. I am confident that in a lot of cases people would simply believe that OLEDB is working in a wrong way for the Columnstore Indexes. There was 1 more option that I have not tried – the “Default Buffer Size” for the Data Flow, and thinking about it right now makes one really good argument about In-Memory part of the Columnstore Technology. By default the value for Buffer Size is set to 10 MB, and so I decided to pump it up until the maximum value available – to 100 MB. This time it has finally worked the way it should have – with “Default Buffer Max Rows” set to 200.000 and “Default Buffer Size” set to 100 MB, I have finally managed to insert the data into a compressed Row Group. Great stuff! Not accessible by default for the unexperienced SSIS developers, but great stuff anyway. :) Now let’s scale it to the maximum and create our compressed Row Groups with 1045678 rows – for that all I need is to set the Data Flow property “Default Buffer Max Rows” to 1.1 Million Rows for example and then just execute the rows. The screenshot on the left of this text shows the progress while executing inserting the data. Yes, your eyes are not lying – there are 385.505 rows per batch at a time. But – WHAT THE HECK IS GOING ON ? We have 2 million rows as the max number of rows per DataFlow, 100MB (max allowed value) of memory per DataFlow Buffer and just 385.505 rows ??? Going with the speed ~1/3 of the maximum Row Group size – this does not look good … At all ! 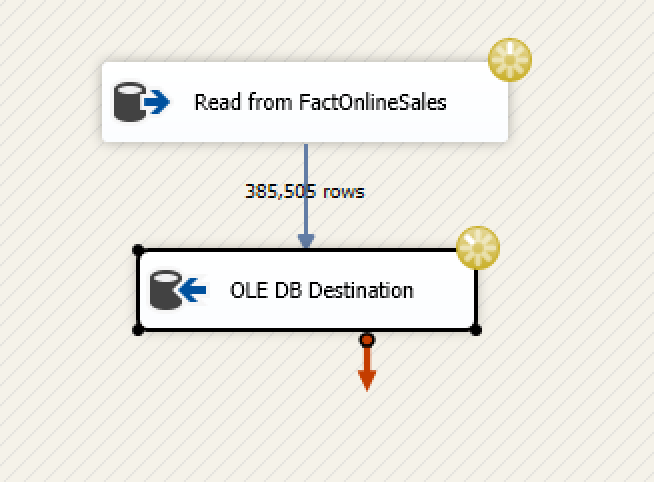 Well, thanks to the help of David Peter Hansen, I have learned and understood better how to use SSIS. The solution for the insertion problem lies within “Maximum Insert Commit Size” option of the OLE DB Destination component in Data Flow. Setting it to be equal to 0 (zero), will make the insertion into the destination table to be delivered in a Single Batch, allowing to reach the maximum allowed number of rows per Row Group. This information made me rediscover the famous Data Loading Performance Guide and re-read it again. Take this, modern In-Memory technology aligned with an amazing Tech that has not had an update for the last 3 years. The issue in this very case is the width of the row and the 100 MB Buffer size limit. There is no dictionary pressure, if you look at the previous blog posts you will see that I have created maximum sized Row Groups on this very FactOnlineSales table countless times. 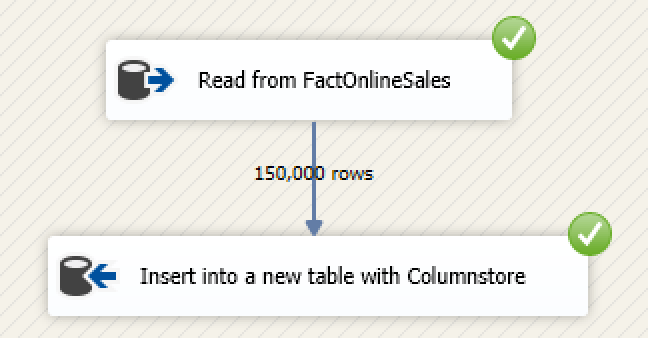 The Row Length at SQL Server is 158 bytes divided between 21 columns, this is absolutely nothing special for the modern fact tables, and yet you can’t reach for the maximum allowed size for a Row Group if you are using DataFlow inside SSIS, loading directly into a table with Clustered Columnstore Index. In the modern times of In-Memory Technologies and current hardware prices and developments, it is below reasonable to maintain the limit of 100MB per Data Flow Buffer. 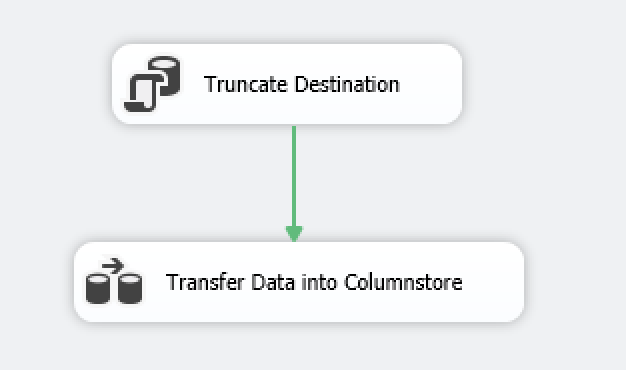 This is the best argument that I have against loading data directly a table with Clustered Columnstore Index with SSIS, something that does not happen, if you are using T-SQL, like for situations when transferring data from Staging into DataWareHousing tables. Please do not ignore this issue just because at the moment your Fact table is actually smaller and you are getting the perfect Row Groups, once you add an extra column, you are risking to change this situation in the middle of development cycle where any architectural change is too late. [ODBC Source ] Error: Open Database Connectivity (ODBC) error occurred. state: '42000'. Native Error Code: 35370. [Microsoft][ODBC Driver 11 for SQL Server][SQL Server]Cursors are not supported on a table which has a clustered columnstore index. The same problem shall occur if you will opt to go for a SQL Command, which is basically like saying – No, you can’t use ODBC for tables with Clustered Columnstore Indexes. 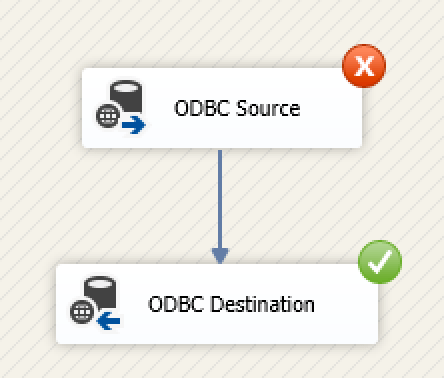 How nice is it, since Microsoft is recommending to use ODBC instead of OLEDB for any future projects. Dear Microsoft SQL Server Integration Team – FIX those things as soon as possible and fix them not only for the future releases but for SQL Server 2014. The buffer manager in the data flow engine can only fit 385,505 rows into a single 100 MB buffer for your execution tree. It lowers the number of rows from default buffer max rows from 1.1 million rows to that number, to make sure the in-row data can fit into the buffer. What I believe you are experiencing is that the OLE DB destination is committing after each buffer (not batch, as you write). This is because when maximum insert commit size is set to >0 and larger than the number of rows in the buffer profile for that particular execution tree, it will do a commit after each of the buffers (and not after each maximum insert commit size). If the maximum insert commit size is set to >0 and less than the number of rows in the buffer profile for that particular execution tree, then it will do a commit after each maximum insert commit size and after each buffer. However, if you set the maximum insert commit size to 0, then it will do a single commit. While I have not tested it with column store indexes, I believe this might solve your problem. I do not understand your argument against having the maximum value of DefaultBufferSize set to 100MB. The data flow engine uses multiple buffers (maximum 5 per execution tree, due to the basic back pressure mechanism (which is a good thing) – but a typical data flow have multiple execution trees). I assume you don’t want first all of your data to be read from the source into a single buffer, before it will start writing that to the destination? Let me know if setting the maximum insert commit size to 0 doesn’t work, then I will try test it. >However, if you set the maximum insert commit size to 0, then it will do a single commit. While I have not tested it with column store indexes, I believe this might solve your problem. That’s cool! This is one of the things that I did not try out, and indeed it has solved the issue! I have only tried to set MICS to controllable commit size values, such as 1.000.000 rows for example, but this value is ignored then, since the buffer is capping number of rows to an inferior value. >I do not understand your argument against having the maximum value of DefaultBufferSize set to 100MB. I thought that Columnstore Indexes insert operation was limited by the size of Buffer from the execution tree where the insert takes place. Yes, I thought that per se this situation would be ridiculous. is there a work-around for ODBC limitation. java.sql.SQLException: Cursors are not supported on a table which has a clustered columnstore index. at the moment the workaround is not known to me. I guess the best way is to open a Connect Item. 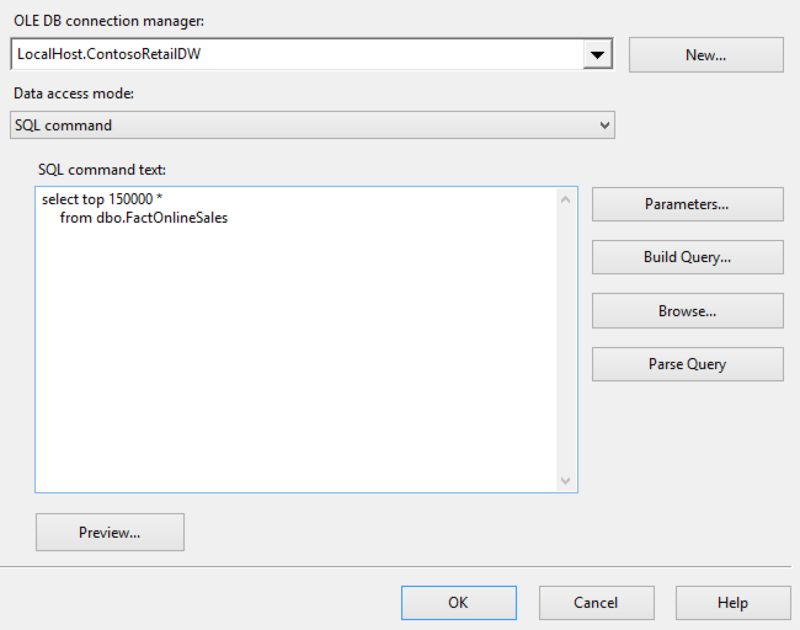 SQL SERVER 2014 does support creation of CCI even if there is a PK present right ? I did not drop it before creating and was able to successfully create a CCI. Am I missing on some part ? glad to hear that you got it solved! It can work wonders for massive data flows. 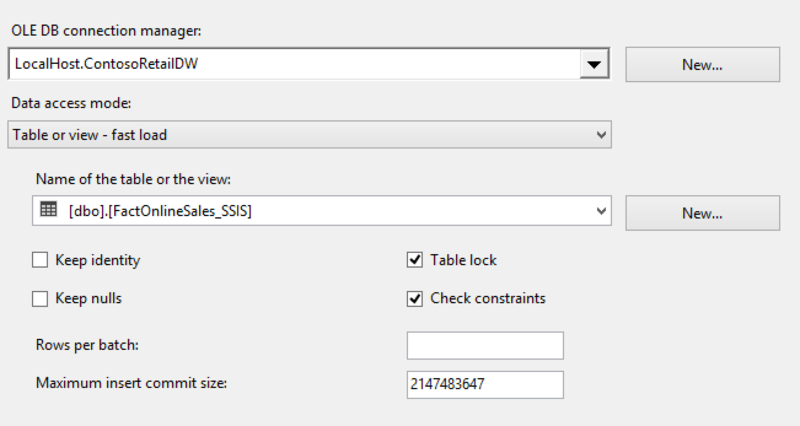 I am still badly disappointed that for so many years it is not provided as a standard part of the SSIS. Have you tested using BDD in combination with various source component settings (buffer size, buffer max rows, commit size)? How does BDD relate to the buffers and the columnstore index – does it split the buffer to equal parts, or is it sending entire buffers to different destinations? In the first case we would then have to modify buffer size accordingly, and in the second, no additional tuning is required? How does BDD’s “parallelism” work on deltastore? I just wanted to drop a comment in here to note that as of SQL Server 2016, the maximum buffer size is now just one byte shy of 2 GB. Denzil Ribeiro mentions this here as well. thank you, I have been mentioning this on my presentations this fact. 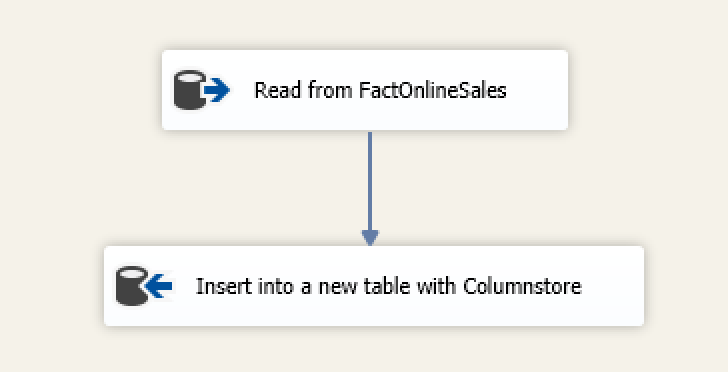 I will update the article http://www.nikoport.com/2016/02/23/columnstore-indexes-part-77-ssis-2016-columnstore/ which is focusing on this feature, to be more clear.